GOG.com Credits have been added to the $50 and the $150 tiers! ALL DRM FREE! $50 = Credit to download a DRM free Space Quest package from www.gog.com of your choice. $150 = Credit to download a DRM free Space Quest package from www.gog.com. That means you get both Space Quest Packages! What really happened when the "Two Guys" reunited? No pledge funds will be deducted from your account until the Kickstarter goal is reached and ended. For international backers, please include $15 extra shipping for rewards that involve physical items. If it's too late, you can square up on PayPal after the end date. Want to help us get the word out? Use http://tgakick.com to make spreading the word easy. It brings you right here! Hey there, Classic Adventure Gaming fans as well as those relatively new to our worlds. 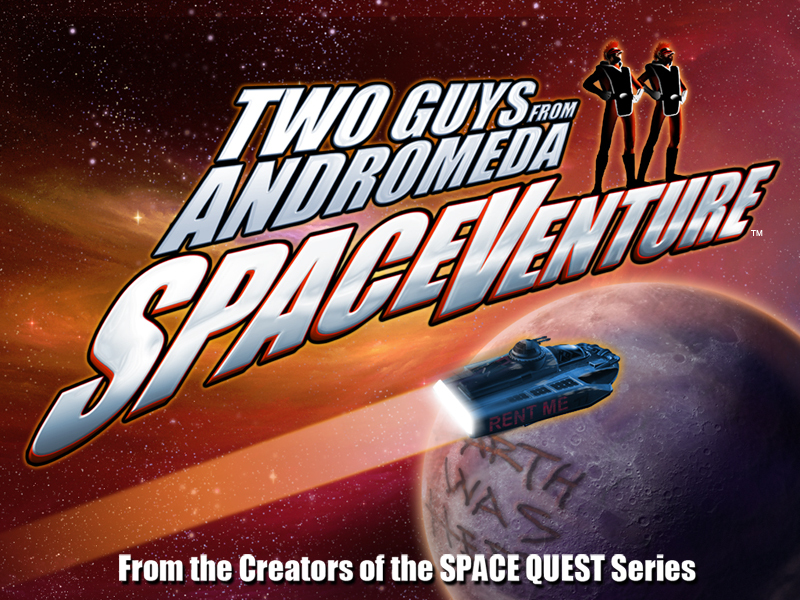 Scott Murphy and Mark Crowe, aka ‘The Two Guys from Andromeda’, are back together. No, your optic orbs have not been on a bender. You read correctly. After a very brief 20+ year hiatus, we have joined forces once again and are tooling-up to bring you a new Space Adventure, or SpaceVenture™, if you will. A little older, a little wider (well, Mark at least) and a bit more demented than before (a toss-up on that one), we're both ludicrously psyched to be working together again. Combine that with what has been literally years of pent-up intergalactic pressurized cabin fever to go with it and we have some real wonderful…, uh, ‘stuff’ to share, incorporating that same style of comedy, wonder and delusion you expect from a Two Guys SpaceVenture™. You’d be very surprised to know the range of requests we sought out and have been received from supporters. We know we can’t be everything to everyone but we're working hard to find a happy compromise. The only thing we won’t compromise on is your game-play experience (and maybe caloric intake). 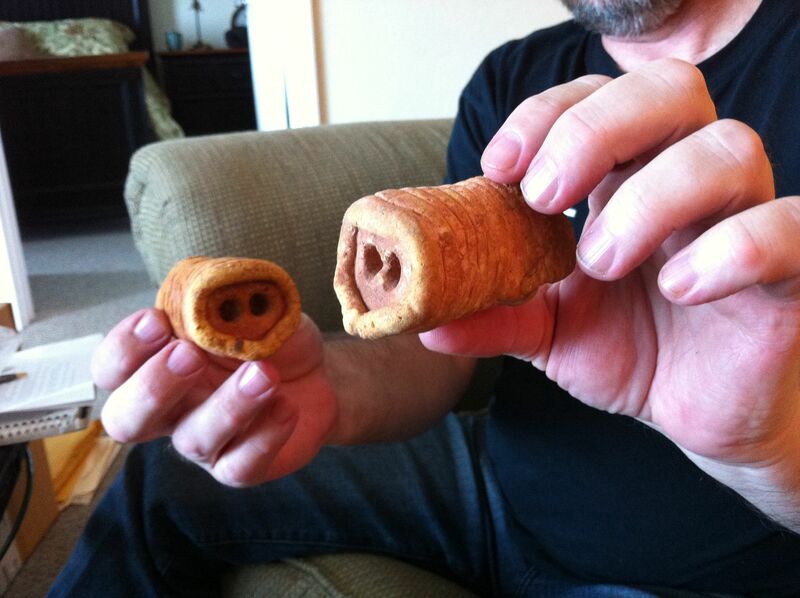 Scott and Mark will have their hands all over this project with final say on everything, including how much cheese and Orat meat goes in the crust. What this means, people, is that no aspect of this game will come into being without the personal, crusty-eyed, occasionally salivating and barely comprehensible approval of The Two Guys from Andromeda. This is YOUR guarantee, for you fans and friends, that everything you are about to see is ultimately the work of The Two Guys. All of those platforms, from day one of the release! Our philosophy from day one and game one was to make games that WE would want to play and that, ultimately, YOU would as well. We aren't straying from what has been a successful formula according to our sales then and your feedback since. We're back to create more while also incorporating what we've learned in analyzing our past work, from you via comments made from the days of snail-mail to the present methods of email and social media. It’s been fascinating to learn what you’ve found fun, funny and/or annoying, and what games you’ve favored. Clearly, not everyone has well-rated taste, but we can work around that. Yes, we're givers! The way games are made and gotten into a player’s home and on to their devices of choice have changed greatly thanks HUGELY in part to Kickstarter. They are helping dreams come true for so many of us. During that time you have continued to talk about the adventure game genre and how you’ve missed it. We're adapting to the changes, taking advantage of them and charting a new course through this new space, and looking forward to finding that ‘new game smell’ that we can enjoy and to bring to you as well. We have fan encouragement, you incredibly loyal fans who have kept the legacy of their work alive. We appreciate the many fan sites, fan games and fiction, game homage’s and remakes, but probably the best part of the past has been directly related to some very enjoyable, interesting and inspiring emails. Thank you for sharing your stories with us about what the games meant to you from whether you enjoyed them (or not), which puzzle(s) made you mad, and who you played them with. Some were actually quite poignant and those will never be lost on them. Yes, you read that right. FREE stuff, another small thing we wanted to do to make your visit to our Kickstarter page special as well as to be a little different than the others, not that they didn’t blaze a brilliant trail for all of us. We think you'll agree that not taking it to the next level would be lazy and sad on our part. We want to give you a small digital ‘thank you’ gift just for showing up and at least considering supporting us. We never want you to feel we aren't grateful regardless of what you decide. We're nothing without you. This wallpaper image was put together for you by Mark Crowe specifically for our Kickstarter campaign. Thank you for hanging in there and seeing this. Please help yourselves to these great graphics at no charge to you. We've recently started our own game studio, Guys From Andromeda LLC. We've invested in the absolute best virtual office environment money can buy (on the cheap). On a serious note, this also allows us to be an Earth conscious company by being able to go Green. No commuting, much less wasted paper and toner, Rogaine for Mark and Clairol for Men for Scott, etc. In doing this, it allows us to hire top tier game developers - all big Space Quest and adventure game fans, of course - to help make this a reality. Having fan-developers means we'll get the best possible results because of the passion they also carry for our style of the genre. This model helps keep costs down on overhead like office space, so more goes into the game.It also allows us to partner with people in quite literally different parts of the world! BUT, with all of this we will need YOUR help! In order to make this dream a reality, we are asking our fans and friends to contribute through our Kickstarter campaign and to help us to once again do what is a serious passion we have never lost, and what drives us to make the very best games we can, games you've asked for. Not only do we have some of the top game developers available, we are also pulling in some of the top voice over talent as well! We take multimedia seriously, if nothing else. For voice talent we know you want the one and only narrator, the man with the golden pipes, Gary Owens. Done! But take a look at, along with Gary, a few of the others already on board to voice our characters. Gary Owens - Narrator from SQ4 and SQ6, voice of Space Ghost, Laugh-in, and many many others in a long and distinguished career. Rob Paulsen - Pinky from Pinky and the Brain, Yakko from Animaniacs, Raphael the Ninja Turtle, and multiple characters from Monkey Island among many other characters he has voiced. Robert Clotworthy – Jim Raynor from StarCraft 1 & 2, Senator Evran & Supreme Chancellor from Star Wars: The Old Republic, and Narrator of The History Channel’s Ancient Aliens series, Big Bang Theory, etc. Ellen McLain - GLaDOS from Portal 1 & 2, Overwatch from Half-Life 2, Administrator from Team Fortress 2, Witch from Left for Dead 2 and many more. John Patrick Lowrie - Sniper from Team Fortress 2, Sword Control from Halo Reach, Citizens from Half-Life 2 and author of Dancing with Eternity. For musical talent we are talking with some of the best composers we can find. Did you like the music from the Space Quest series? We are in talks with some of the original composers, including the man that brought you the music from Space Quest 3, Supertramp rock legend Bob Siebenberg. A Sci-fi adventure from Scott Murphy and Mark Crowe working happily together as a team once again. Game music that will hopefully give you chills and wedge in your main orb for the rest of your natural Earth life and make you wish you lived inside your computer! Yes, we know, they all say that, but WE really mean it! Fresh from the Sarcasm Cluster and the Hyperbole Nebula, this is the first Kickstarter effort by the Two Guys From Andromeda. We're here to tell you THIS is huge to us. We really are going to do things differently than some of the other campaigns you may have seen, even though we love those people, so don't take that in a mean spirited manner. We know you guys are aching for something truly special, so we've been butting heads in the Andromedan luxury bunker to come up with a way you guys can feel extra, extra special while we empty your bank accounts for our own devious, suspect ends: You are going to get something fun to play throughout our Kickstarter campaign! Yeah, you read that right! Every time we reach another $100,000 milestone, we’ll release another enhanced prototypes version for you to play. We will take your feedback to improve the demos for each milestone. Everyone involved in the project will be keeping a project diary, including Scott and Mark! (You may have problems reading Scott’s, but we'll do our best to provide Cliffs Notes or a hieroglyphics translator.) Do you ever wonder why Scott chose a specific piece of dialog to go into a particular game situation? 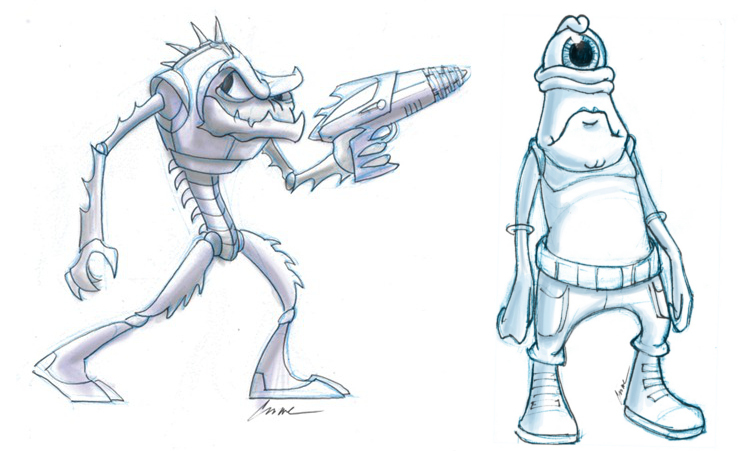 Or how Mark built the Space Quest 2 box or was inspired to create art for a certain game location? Wouldn’t you like to know? 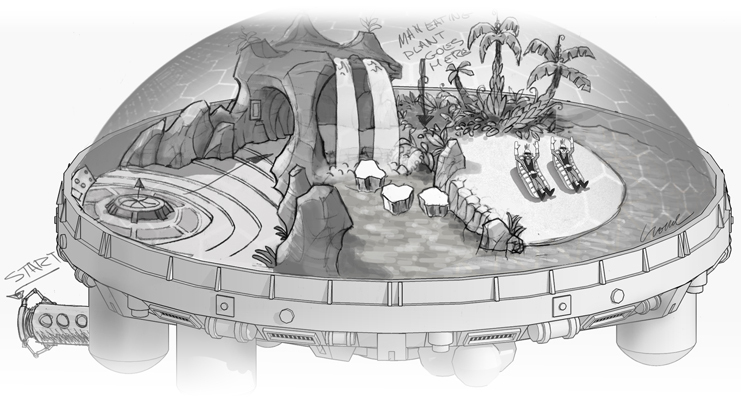 These are the things you’ll be privy to in our behind-the-scenes diaries for the new game! The project diary will be dated and time-stamped as everyone involved documents their thoughts and feelings throughout the game development process. (Don't be alarmed by occasional high-pitched sounds that sometimes drown out the spoken audio. It's really just a technical glitch. Those crazy gizmos these days! or bleeps as they are know in the industry.) This will include lots of behind the scenes photos, short videos, and audio clips that give you fascinating insight as to how things were brought to life - and how much we had to tip the cleaning lady to remove trace evidence. Alright, let's talk rewards! We know you're dying to be rewarded. (Who isn't?) And we're dying to reward you because, really, we wouldn't be in all this mess without you guys, right? We know that and we appreciate it. We hope you know that. So, apart from the running demo thing, we really want to make sure you get something of additional value. First of all, everything you have read above is being giving to you at just $15. That’s right, a DRM-free digital download version of the game for PC, MAC, or Linux, a code that allows you to play the game on Steam, as well as all the behind the scenes material turned over to you once the game has been released. All that for just $15! We may even get the Space Quest historian to write you a completely generic congratulatory message - with YOUR name cut and pasted in. Yes, YOUR name! Just for being so awesome! Okay, we can sense that won't cut it for some of you. Well, if that doesn't sound exciting enough, how about this? We created this chart to help you understand the rewards you’ll get for participating in the various tiers of our Kickstarter campaign! Some of our rewards allow you to have your name etched in digital eternity by becoming part of the game. One thing you have made VERY clear to us is that although you want to see your name in the game, you also don’t want to take away from the game play. So, to help with this, the game will randomly select a name from the pool of those people who have paid the highest amounts and plop them fully across the screen at regular intervals for the duration of the playing exper-- sorry, that's not right. Of course, we're kidding! Here's what's ACTUALLY going to happen: There will be a very limited amount of names in the intro credits. There will also be many well crafted ‘Special Thanks’ in the closing credits which will optionally run upon exiting the game. These will not hinder game play or the experience in the least. You may be credited as the Head of the Andromedan Nose Ministry, or maybe the High Council on Mohawk Regulation and Hair Product. Many of you want more recognition, so we’re giving it to you. Who are we to argue with vanity? The game will have ‘hidden objects’. There will be a collection of digital fan cards placed very strategically in the game. When you see one, you simply click on it, and the card will zoom to the front of your screen and tell you about the fan on that particular card. We feel this will add an extra element to the game, get you excited to give to the project, and give us the ability to reward you in the game for finding them all. But if that doesn’t appeal to you, we’ve thought of that too. If you feel this hinders your game playing experience, you can simply disable this feature at any time! But that one idea you guys had actually made a lot of sense. We're not going to force our closest friends and most loyal supporters down the throats of people who couldn't care less. But we ARE going to give the people who truly want it to have the chance to turn on the feature for all to see, and bask in your glory. Oh, and did we mention we love you? Oh, you knew that already, right? We wish to express our sincerest thanks and gratitude to some amazingly talented and dedicated folks for helping us get this Kickstarter campaign launched in high style. 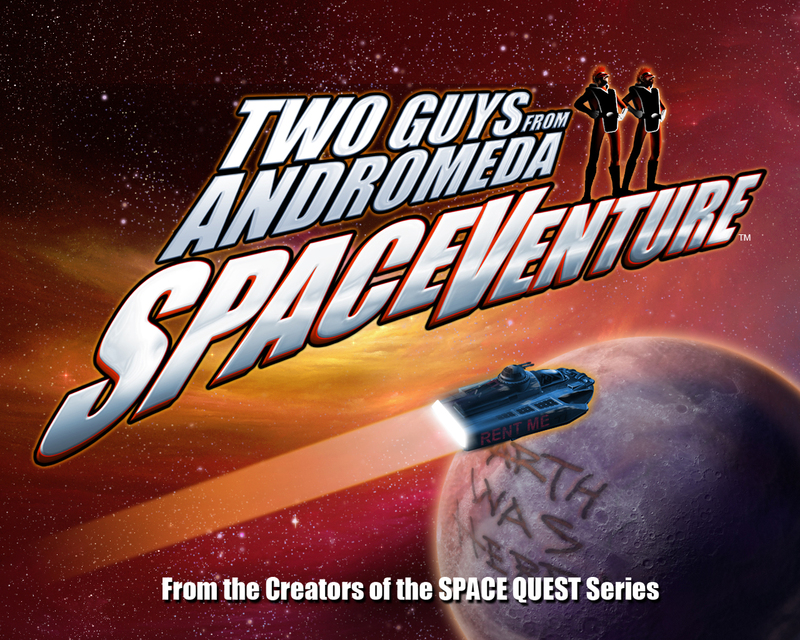 SpaceQuest.Net has been so amazing for allowing The Two Guys From Andromeda to house their forums with them! 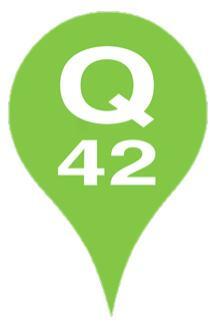 Martin Kool and Q42, a studio based in the Netherlands, with a passion for the adventure genre for approaching us with some innovative solutions for bringing our vision to multiple platforms simultaneously. You’ll be seeing more of what we mean in the next few days and coming weeks as we rollout something really innovative and unique to the whole Kickstarter concept. Not coincidentally, Martin is responsible for Sarien.net and for bringing some of Sierra’s classic games (including Space Quest) to the iPad. Check out his site.